Bristlenosed catfish is not very hard to breed in aquariums. Keep one male Bristlenosed catfish with several females, and make sure they are all in top condition. Provide them with good water quality and a varied and nutritious diet. You will most likely never notice the actual spawning behaviour, just the result of it in the form of tiny Bristlenosed catfish babies that suddenly appear in the aquarium. From what we know about Bristlenosed catfish breeding habits, the spawning seems to be initiated by the male catfish. He will pick a suitable spawning site, usually a cave or a crevice, and subsequently start chasing the females as a part of the courting behaviour. The females will repeatedly inspect the spawning site and this part of the spawning can go on for several days. Eventually the female catfish will deposit her eggs at in a clump at the spawning site where they are fertilized by the male. Newly deposited eggs from a Bristlenosed catfish display a bright orange colour. The female will leave the spawning site immediately and do not stay around to guard or care for the eggs. 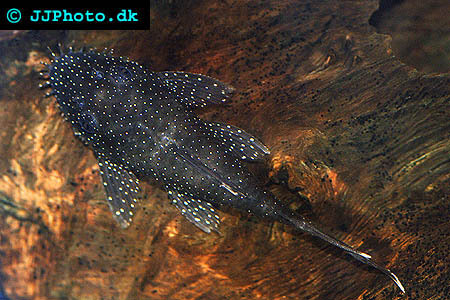 The male Bristlenosed catfish stays at the spawning site to protect the eggs from predators. The will place his tail near the eggs and let his head protrude out of the cave or crevice. He is probably placing his tail close to the eggs in order to care for them by fanning fresh water over them, but this has still not be determined. The male Bristlenosed catfish is a very capable parent and you should never remove him from the eggs or try to raise catfish eggs in a breeding tank without the male present. Fry will emerge from the eggs after 4-5 days. The fry will still eat from their yolk-sac. They will start to spread over the aquarium, and in a community aquarium a lot of them will soon be consumed by the adult fish. If you want to ensure a high fry survival rate it is recommended to breed Bristlenosed catfish a separated tank. You can even remove the females from the aquarium, and leave the fry with the male. When the fry has been free swimming for a week you can remove the male as well. High oxygen levels are very important for Bristlenosed fry and good aeration in the aquarium will typically lead to a higher survival rate. When the yolk-sac is consumed you can start feeding the Bristlenosed fry vegetable food, such as very finely cut lettuce and cucumber. Dip the vegetables in boiling water before you place them in the aquarium. A good algae growth in the aquarium is beneficial for the fry since this is their natural food source. If kept on a suitable diet the fry will be around 1 ¼ inches long after two months.